This article is a short summary of Pokémon Gold and Silver Versions. Pokémon Gold Version (Japanese: ポケットモンスター金 Pocket Monsters Kin, literally Pocket Monsters Gold) and Pokémon Silver Version (Japanese: ポケットモンスター銀 Pocket Monsters Gin, literally Pocket Monsters Silver) were the fifth and sixth Pokémon games released, beginning the second generation of the Pokémon series. Developed as a sequel to Pokémon Red and Green, Gold and Silver expanded the Pokémon world westward into the region of Johto, where 100 Pokémon not appearing in the earlier games could be found. 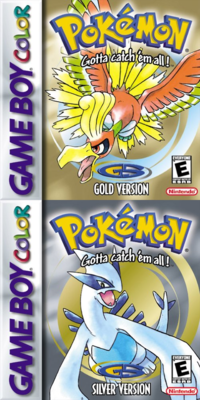 The two games were later followed by a third version with minor changes titled Pokémon Crystal, and then remade as Pokémon HeartGold and SoulSilver for the Nintendo DS. "Enter a whole new world, with new Pokémon to capture, train and battle! Meet Professor Elm and get the all-new Poké Gear, including map, radio, cell phone and clock. Set the clock then watch as day turns to night and events take place in real time— and be sure to keep an eye out for Pokémon that come out only at night!" Much like the prior games, Gold and Silver follow the story of a young man traveling across a region of the Pokémon world on a quest to gather eight badges, defeating an evil group along the way. Team Rocket returns as antagonists, attempting to revive the group and locate their lost leader Giovanni, who fled when he was defeated by the first games' protagonist. After defeating Team Rocket and Johto's eight Gym Leaders, the player can then travel back to the region the first games took place in, Kanto, to challenge a new Elite Four group and, eventually, its own Gym Leaders. The protagonist of the first games, Red, waits atop Mt. Silver as the game's final challenge after all eight Kanto badges are obtained. Gameplay is, for the most part, unchanged from the previous Pokémon games. A major innovation is made with regard to finding Pokémon in the wild, with the new real-time clock affecting many events. Certain items and activities can only be found once per day or once per week, while some wild Pokémon are exclusive to one of the three time periods, morning, day, and night, that the game cycles through. The battle system is slightly revamped, with two new Pokémon types added to balance out the type chart. The Dark-type features sinister Pokémon which typically come out at night, and weakens the Psychic-type which was overly powerful in the previous games. The Steel-type resists the moves of most types, including Psychic, and includes two Pokémon from the older games under its typing: Magnemite and Magneton. Both Steel and Dark are weak to Fighting-type moves, a type that was previously hindered by its own weakness to Psychic. By using a link cable, players of Pokémon Gold and Silver are able to trade Pokémon with the games previously released on Game Boy, which is required to complete catch all the Pokémon which do not appear in Gold and Silver. This page was last edited on 29 October 2018, at 01:42.